The West Virginia Senate just passed a bill criminalizing attacks on sports officials. West Virginia SB 385 now moves to the West Virginia House of Delegates. If it passes both chambers and is signed by the governor, the law will make West Virginia the 20th state to pass legislation criminalizing batteries upon sports officials. Unfortunately, sports officials assault legislation (or, to be more accurate, "battery legislation" since the legal phrase for an attack is "battery" in most states) reflects the ugly reality that sports officials are frequently attacked by parents, coaches, and participants who don't like their calls, and comes on the heels of some extremely ugly incidents around the country. The most notorious of the recent incidents occurred in Florida, where a high school basketball player body slammed an official to the ground to protest a foul call, an ugly incident captured on video and getting a lot of play on youtube and in a number of other places. The news coverage implies that attacks upon officials are an uncommon, and therefore newsworthy, event. While the Florida attack was uncommon in its severity, the truth is that there's an ugly attack on a sports official almost every day somewhere in this country. The preamble to the West Virginia Senate bill puts it best, noting that sports officials are more likely to be attacked than most people, and there's often little recourse for them when they are. Well, there will be some recourse in the future - assuming the West Virginia House passes the Bill. 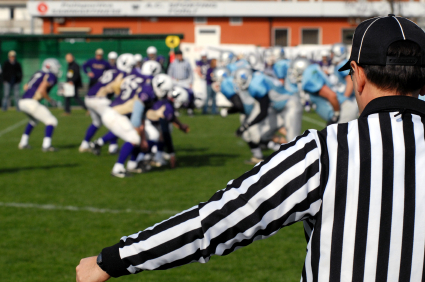 There are surprisingly few studies on attacks on sports officials. Indeed, I only know of two. Differences in questions and methodology probably account for some of the differences between my study and the Rainey/Duggan study. Also, it should be noted that the San Franciscans likely worked a disproportionate number of adult Rec-League games. Only 10.4% of officials in my study were attacked at high school games (and yes it should be noted that I am a high school commissioner in San Francisco, but the study was conducted in 2001 prior to my tenure as commissioner and I didn't ask whether officials were attacked in games featuring the schools that I would eventually govern). Differences in methodology aside, the numbers are high enough to justify assault legislation. Ask yourself whether you would want to work in a job in which your chances of being physically attacked are 1 in 7? You probably wouldn't want that job. Of course, we do know that mail carriers are the exception that proves the rule, as we can assume that a disproportionately high number of mail carriers have been attacked by dogs. However, mail carriers aside, how many people would be willing to accept such a high frequency of attacks in their profession or avocation? The sad reality is that today's hypercompetitive world of youth sports, which is supposed to promote sportsmanship and respect, does just the opposite: creating an environment that drives away prospective officials, which leads to a shortage of officals, which drives down the pool of quality officials, which, in turn, leads many youth leagues to hire teenagers to officiate, who, because they appear non-threatening, invite yet more attacks, which thus drivews away the next generation of officials. This vicious circle continues, harming the games that we hold dear, with no end in sight. Here's hoping legislation like being considered in West Virginia helps reduce the number of attacks. I'm not holding my breath. 1. Rainey D, Duggan D. Assaults on Basketball Referees: A Statewide Survey. J. Sport Behavior 1998 (3): 113.